This is it. We’ve finally arrived at the end of November, and sure enough, December is right around the corner. The final academic push — appropriately known as “finals” — is looming over your shoulder, and if you’re like most stressed out students, then you’re probably already feeling the pressure even after (what we imagine to be) a relaxing Thanksgiving break. First off, before we dive into some tips and insight on preparing for the academic battleground of finals week, we truly do wish that you had a rejuvenating Thanksgiving break filled with rest, laughter, and plenty of amazing food. 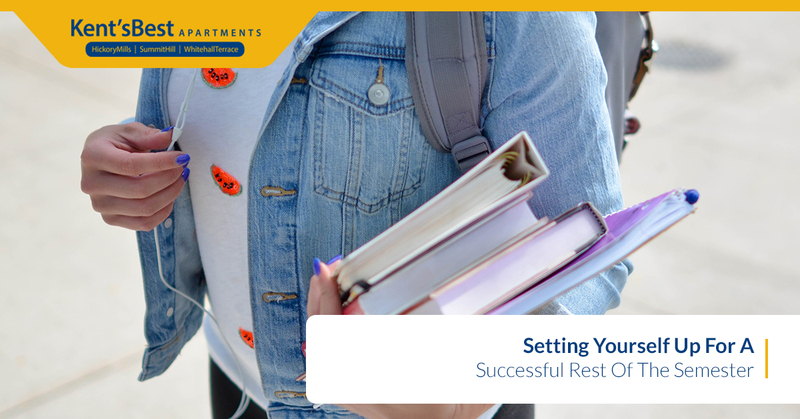 Whether you choose to spend part of the long weekend studying or you committed to leaving your textbooks back at our Kent apartments, a successful Thanksgiving break is the first step to ensuring that you have a successful finals season. 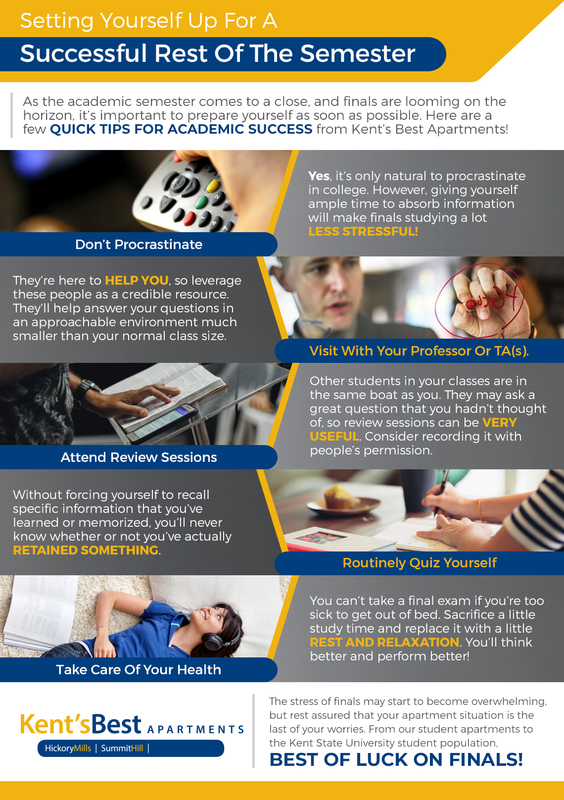 Kent’s Best Apartments Is Here To Support KSU Students Like You! Though we won’t be there to hold your hand throughout college (nor should we — college is a time of burgeoning independence! ), Kent’s Best Apartments can help by providing the best apartments near Kent State University. At the end of the day (or the semester, rather), you’re here to study and further your career with a degree from a reputable university. You’re not here to worry about your living situation, and that’s why we have your apartment situation totally covered. From the Hickory Mills Apartments to the Summit Hill and Whitehall Terrace Apartments, living with us is great because you’ll always be mere steps away from campus. Better yet, each of our Kent apartments offers built-in utilities, newly remodeled units, free parking, 24-hour maintenance, and much more! No matter how you look at it, it’s a true win living with us. Now, for the good stuff — let’s take a close look at several great ways to prepare for the end of the semester. We only have two weeks left before it’s all over. Two weeks. While that sounds like great news (which it is, because you’re almost done with the semester! ), this means that you’re going to blink and then find yourself blankly staring at your final exam. With Thanksgiving break and finals season so close to each other, it’s easy to leisurely get back into the academic flow post-Turkey Day, only to realize that you only have two days to study for all of your finals. The best thing you can do for yourself is to get cracking right when classes start back up. You’ll thank us later when you’re not stressing out right before finals. What sounds like a waste of time may actually pan out to be the most valuable way you’ve spent a couple hours all semester. Sure, you may hear some off-topic conversation or some really dumb questions during the experience, but review sessions are great because you’re likely to hear something covered that you didn’t think about on your own, but were glad to hear. In the eyes of your TA, showing up to a review session shows that you’re a dedicated student who cares about their grade and is willing to work hard in order to receive it. Either way, you have to study, so why not take an individual study break and go learn with other students who are in the exact same boat as you? We know; this is possibly the most generic advice that we could give about finals preparation. It’s also the most important piece of advice to follow, because what good is studying for an exam if you wake up too sick to get out of bed that very morning? A healthy body is required to maintain a healthy mental state. If you’re really feeling the academic stress and you just can’t cram any more knowledge into your bursting brain, take a break and go exercise. Make sure to drink plenty of fluids (ahem, mostly water and electrolyte-reinforced beverages). Eat real food like fruits and vegetables. Don’t forget to soak up some sunlight despite the fact that it’s getting pretty cold and dark these days. And for the sake of the academic gods, at least try and shoot for six to seven hours of sleep every night. Eight is preferred, though we understand that’s not always realistic — especially during the heat of dead week. Your professor and your TA(s) are here to help you. That’s what they get paid for through a stipend, salary, tenure, or otherwise. Put these valuable and knowledge resources to good use by letting them know that a) you care about your grade and b) you’re struggling with X concept or Y problem. There’s really no more credible resource to turn to for the right information than the ones teaching the course. Here, you can pick their brains, take notes, and ask questions in a more intimate environment that’s not as socially intimidating as the classroom. As a bonus — though you should never expect this — your professor or TA may even throw you a freebie or two just for showing up to their office hours and asking questions. Study On From The Comfort Of Our Kent Apartments! When the library is looking too dreary and you’d rather cuddle up with your pet and your textbook, our pet-friendly student apartments in Kent are always here for you. Thanks for stopping by, and best of luck, students! Read More Student-Friendly Resources Here!